Facts and history about the life and lifestyles of Native American Indians. The sacred pipes used by Native Americans are known by by various names including the Calumet, the Great Pipe, the Medicine Pipe and the Peace Pipe. The ceremonial smoking pipe, called a Calumet, was often used to seal a peace treaty, hence the term 'Peace Pipe'. Sacred Pipes were used in sacred, central rituals and tobacco ceremonies of Native Americans. Pipes were the most potent symbols in these rites demonstrating harmony and brotherly love. However, the Calumet was also used to offer prayers in religious rituals and ceremonies and during war councils. The life, history and lifestyle of Native American Indians is a varied and fascinating subject. The following fact sheet contains interesting facts and information on the Peace Pipe, also referred to as the Calumet. It was believed that tobacco was a gift from the Great Mystery, and that the exhaled tobacco smoke carried thoughts and prayers to heaven. Peace Pipe Fact 2: The French word 'calumet' means "pipe" is derived from the Latin word 'calamus' meaning "something made or shaped like a reed"
Peace Pipe Fact 5: The use of sacred pipes in religious ceremonies and rituals spread across the length and breadth of the North American continent and became an important part of the culture of the Native Americans. Peace Pipe Fact 6: Sacred Pipes were considered as holy objects and treated with great veneration. They were the containers that held a burning offering and linked the user, via the stem and the smoke, to the unseen world and the Great Spirit. Peace Pipe Fact 9: It was only when the stem was inserted in the bowl that the pipe became potent. The two parts were therefore kept apart and only joined at the beginning of the sacred ceremonies, and separated at the end of the ritual. Peace Pipe Fact 11: The design and size of the Peace pipes varied according to the purpose and symbolism of its use. Some were constructed with a very long stem that enabled the, often hot, pipe to be offered with both hands. 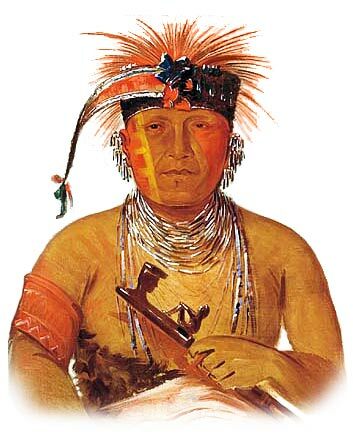 Peace Pipe Fact 13: Tobacco (Nicotianna tabacum/rusticum) was a sacred and valuable commodity and was used as a type of incense, a sacred offering and during special rituals including those involving Spiritual Healing, the Sweat Lodge rituals and the famous Vision Quest. Peace Pipe Fact 16: The 'Peace Pipe' was a central feature of Pow-Wows, which was the name given to important gatherings or meetings. The pipe ceremony consecrated peace alliances. A Native American would not break the words that were spoken in the presence of the sacred peacepipe. The smoke symbolized truth that went directly to Great Spirit, the Great Mystery. Peace Pipe Fact 17: During ceremonies and rituals the peacepipe was nearly always passed by carefully cradling of the bowl in a clockwise direction which represented the travel of the sun. At the end of the ritual the peacepipe was dismantled to be stored separately and the ashes returned to the earth and blessed. Peace Pipe Fact 20: The open display of a 'Peace Pipe' was used as a passport of peace and acceptance when traveling in distant regions amongst unknown tribes.